BHOPAL: Three men suspected of having links with the banned Khalistan Liberation Force (KLF) were arrested from Madhya Pradesh’s Gwalior district on Wednesday night. 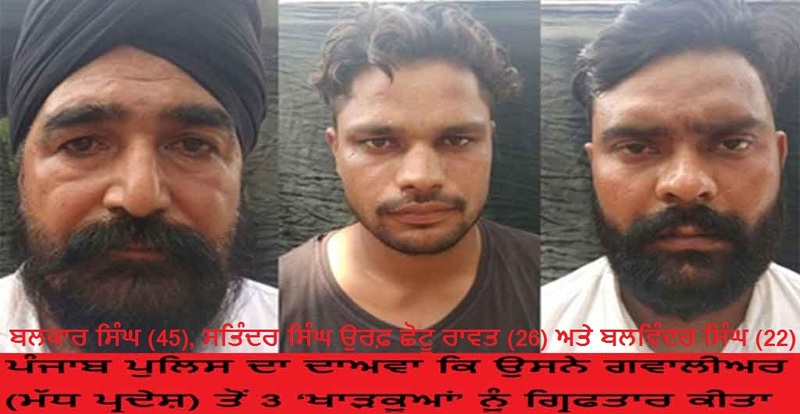 The three were nabbed from three places in the district during a joint operation by members of the Punjab Police and the Madhya Pradesh Anti Terror Squad (ATS). The three have been identified as Balkar Singh, Balwindar Singh and Satindar alias Chotu Rawat. They were arrested from Thatipur, Chinor and Dabra areas of the Gwalior district (300 km from Bhopal) respectively. 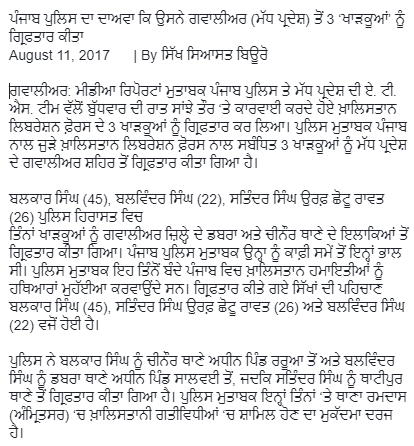 The three, aged between 25 and 48 years, is suspected of having supplied arms to the pro-Khalistan terrorist group, police said. A Punjab Police officer who took part in the operation told this newspaper that the three are suspected to be key members of the KLF arms supply chain. A case was lodged against them at the Ramdas police station in Punjab’s Amritsar district in May after the Border Security Force (BSF) recovered arms and ammunitions from near the border with Pakistan. The BSF arrested two KLF linked terrorists, Maan Singh and Sher Singh, as they were collecting the arms and ammunition near the border. Soon after, three more arrests were made that of Gurdayal Singh, Jagroop Singh and Satwindar Singh from Punjab in June. Upon questioning the three, the Punjab Police came to know the trio living in the Gwalior district of MP were key links in the KLF’s arms supply chain.